The tenth of September has become a World day to raise awareness worldwide against suicide since 2003. It is the World Suicide Prevention Day “WSPD” and I think this year we feel its importance in Egypt, at least in Cairo. The World Health Organization “WHO” and the International Association For Suicide Prevention “IASP” aim from that day would provide worldwide an action to prevent suicide. Recently we were hit by a wave of suicide cases in Cairo and Giza. 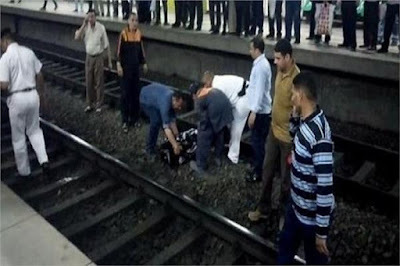 In the past month and a half , Egypt has recorded 7 cases of people’s suicide at Metro station. Young people throwing themselves in front of Metro trains to end their lives shockingly. Six of the cases was for young men while only one case was for a young girl who was only 20 years old. There is no official number of people who commit suicide in Egypt. It is another taboo like the number of Christians in the country I suppose. I found in WHO data that the suicide mortality rate in Egypt is 4 cases per 100,000 people in 2016. 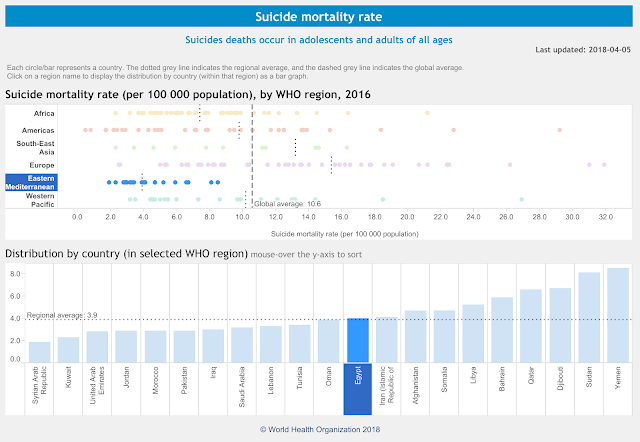 Yemen and Sudan had got the highest suicide mortality rate in the Eastern Mediterranean region according to the WHO with 8.5 and 8.1 per 100,000 people respectively. I think you know why Yemen has had a very high suicide rate. That war does not only kill people but it also forces them to kill themselves !! According to the Egyptian Coordination for Human Rights NGO that from January to August 2018, 150 cases of suicide for young adults between 20-35 years old have been recorded. I found that number in a report about recent metro suicide cases in DW. I can’t find that study on the NGO’s FB as its website is down but it did publish annually about suicide cases in Egypt. The only official reaction we got from the government we got from the minister of transportation and not the minister of health interestingly. Minister Hisham Arafat said in an interview with Pro-regime TV host Ahmed Moussa that the social problems were the reason behind those suicide incidents and that the suicide cases in Metro lines. He added that those incidents were not that unique because “people around the globe commit suicide at the Metro stations”. He asked the people not to commit suicide regardless of the pressure they face. The only news related to the World Suicide Prevention Day that caught the people attention on social media, how belly dancer and attention seeker Sama El-Masry was filmed while presenting to the Metro authority a request to have those “happiness kiosks” in the metro stations in order to stop people from committing suicide. Those kiosks would provide psychiatric help to the people in trouble. It seems to me that El-Masry was the only celeb “even as D-List celeb” who remembered that day and despite it is just a media stunt but it is interesting and should be discussed as an attempt to stop this sad suicide race. Some say that we are 100 millions and we should not be worried but personally I think we should be worried. committed suicide earlier this month in Egypt "Akhbar Al-Youm"
Using social media and hashtags, both WHO and IASP hope to drew more attention to suicide and to prevent it but preventing suicide will need more than that. According to the WHO’s first-ever report released about suicide, more than 800,000 people commit suicide every year around one person every 40 seconds. Yes, it is extremely alarming. Most of the suicide cases “75%” occur in the low and middle-income countries aka developing and third countries. In those countries, young adult and elderly women have higher suicide rates than their counterparts in richer countries. I guess we do not need to discuss why in today’s world a person would his or her own life in these countries. The WHO said that it wanted the governments around the globe to be committed to fighting suicide according to coordinated plans. Only only 28 countries are known to have national suicide prevention strategies, I quote the press release of the WHO. Please if you have any suicide thoughts, seek help for real. If you fear that your friend or relative is going to commit suicide then help her or him but do not preach to him or her. They do not need preaching, they need someone to give them a hand in order to make them come out of that dark pit. Depression can kill easily and by the way, people who commit suicide sometimes hide their dark thoughts beneath a smiling mask. The list of people committed suicide includes also presidents. Aside from Hitler, there are Dipendra of Nepal and Moohyn of South Korea. Think positive, you might get lucky. When I was a young woman, my fiancé committed suicide and something my mother said at the time has stayed with me throughout the years since... “Suicide is a permanent solution to a temporary problem.” She didn’t say that to make light of issues in a person’s life, merely to highlight the fact that many things can change dramatically in someone’s life in relatively short periods of time, but that suicide ends any chance of any type of change. I just found your blog, thank you for sharing small pieces of your life and thoughts with the rest of the world. I like to think that if more people communicated with others (the good as well as the bad) that there would be less hate in the world. When you know someone who comes from a different background, and thus perspective, it is harder to have a “blanket hatred” and fear of others with that same background. When there’s less hate and fear, there is more love and understanding. Thank you for contributing to the side of love and understanding! XOXO, B. Your words mean too much to me. First of all I am sorry to know that your fiancé committed suicide , may god bless his soul. your mother is a wise lady for sure because she summarized in few words what suicide is.